Not sure how I missed publishing this post last night, but I did, so here it is now (not that anyone would have missed much if I hadn't posted it). 1. Today I went on a field trip to the zoo with my Buggy's class. We had a ton of fun and got to see a newborn giraffe during our tour, in fact if we had gone to that area first we might have seen her being born!! 2. Prep for the weekend is a big project. Hubs and I both work tomorrow and Saturday and then I work at 5:45 on Sunday!! We are only having 3 people over besides the six of us, but we've never hosted a holiday meal so it's a big deal! Tomorrow we will be buying goodies for the girls Easter baskets and looking for a ham (which neither of us have ever made, eek!). 3. I didn't get up and run this morning and I won't be tonight either, I am just feeling overwhelmed with things that we need to get done, so much so that I don't feel like doing anything. But, really I know that we will get everything done and I'm just being lazy and using it as an excuse!! Going to have to get it done tomorrow (or I'll skip my short run since I also need to find a way to fit in my long run this week). This Bald Eagle is the image that showed up for me the first time. I loved it immediately! It reminds me of so many great things. Birds of Prey are gorgeous and strong and free! I love looking at the eagles when they come to nest at the lake where I work, they always amaze me with their strength and beauty. 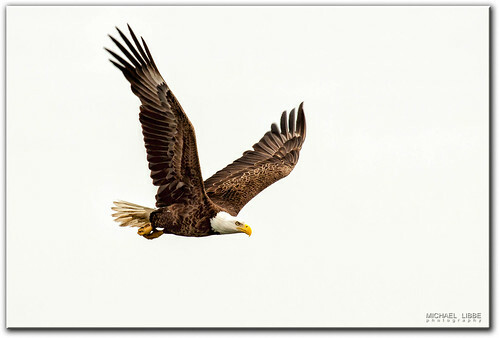 After that the image invoked a sense of pride, the Bald Eagle is our National bird, it always makes me think of the strength and beauty of our country (thank goodness this is our National bird, not the turkey!!). I looked at a few more photos after the first, just to see what popped up and if any of them were more interest to me, but I stuck with the Bald Eagle because he was so majestic. That giraffe is adorable! Great photo! I'm going to try and find a way to squeeze a long run in this weekend too! ps: That baby giraffe is mucho cute! Wow, I love that you got to see a baby giraffe! Enjoy the Easter weekend!